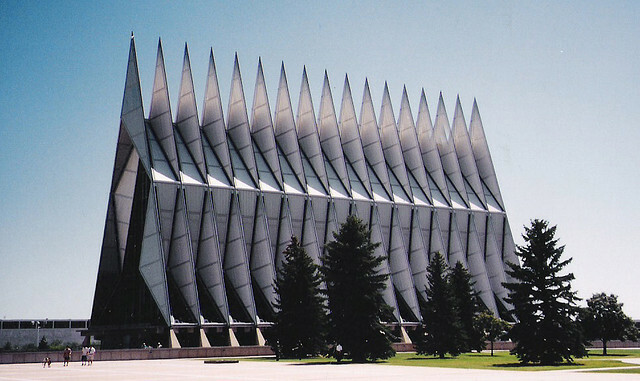 The US Air Force Cadet Academy Chapel was designed in the 1950’s by Walter Netsch, an architect with Skidmore, Owings and Merrill, the firm that had won the commission to design the new academy. It remains the most visually striking building in the academy complex. As there were not enough funds allocated in the military budgets to build separate chapels for the Jewish, Protestant and Catholic cadets, Netsch’s task was to design a single building that would house all three. Under the metal and stained glass triangular form, Netsch divided up the floor-space along contemporary religious demographics: the Protestant Chapel seats 1200, and the Catholic Chapel 500, the Jewish chapel 100. The chapel courted controversy from the time it was first proposed. Sheri Olsen notes that chaplains at the academy expressed concerns about the design, noting the obvious ranking in the architecture and also raising concerns that the building offered little flexibility to respond to what might be a changing religious cadet demographic. Senators and others who had oversight of the funding seemed less concerned with these issues than whether anyone would recognize it as a “religious” building at all. One voiced concerns that “worshiping in the chapel would be no different from worshiping in a modern art museum or a skating rink.” Given the Cold War context, very few seemed troubled by the explicit links made between the technologies and symbols of jet-age war and the technologies of prayer. Despite the controversy and complaint, the Chapel opened in 1962 and has been in use ever since. Chapel attendance was mandatory for cadets through the 1960s. Hutchison’s critique of the Chapel’s bold statement of Protestant hegemony was penned in 2003, several years before allegations arose regarding the Air Force Academy’s endemic culture of evangelical Protestant proselytizing and religious discrimination. Lawsuits, internal investigations, and other issues have followed this nationally-broadcast story, and continue to raise concerns about both the dominance of Protestantism at the Academy and, more broadly, how accommodation of multiple religious beliefs and practices can take place therein. Today, the Chapel’s website notes that it has made space under its roof for Buddhist and Muslim prayer, and there is a circle on the Chapel’s grounds for “earth centered” religions. Its head chaplain is Muslim.